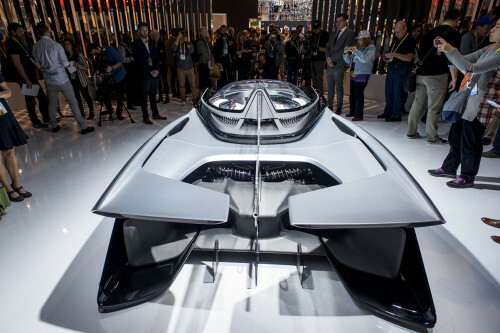 Faraday Future FFZero1 all-electric concept car CES 2016 Las Vegas. LAS VEGAS — Las Vegas welcomes back CES 2016, Jan. 6-9. Considered the world’s premier annual innovation event featuring the latest in consumer technology, CES has called Las Vegas it’s exclusive home since 1978. The event will draw more than 165,000 attendees including 45,000 international attendees from more than 150 countries. With more than 6,000 registered media from all around the world, Las Vegas will take center stage as an international innovation destination. In addition, more than 48,000 senior-level executives will attend CES and 82-percent of Fortune 100 companies have representatives here underscoring the fact that Las Vegas is a serious place to conduct business.In addition to the impact CES has on the technology world, it also benefits the Las Vegas community with nearly $140 million in direct visitor spending supporting more than 1,500 local jobs. On Tuesday, The Consumer Technology Association (CTA)™ – formerly the Consumer Electronics Association (CEA)® announced its continued support of the Las Vegas community through a new partnership with education technology company EverFi, and donations for sustainability projects in Las Vegas and the surrounding community. This marks the eighth consecutive year that CTA – owner and producer of CES®, the world’s gathering place for all who thrive on the business of consumer technologies – has given sustainability grants to the greater Las Vegas community. See attached press release for more information. + CES Tech East includes the Las Vegas Convention and World Trade Center (LVCC), Westgate Las Vegas, and the Renaissance Las Vegas. Tech East is home to innovative product categories from audio, automotive electronics, video and wireless and also features international exhibitors. + CES Tech West includes the Sands Expo and Convention Center, The Venetian, Palazzo, Wynn Las Vegas and Encore at Wynn. Tech West features leading companies and the newest innovations in lifestyle technologies, including fitness and health, the Internet of Things, sensors and other high-growth technologies changing the way we live, work and play. Tech West is also home to the flagship startup community known as Eureka Park. Eureka Park will feature more than 375 start-up companies providing a unique opportunity for budding entrepreneurs to launch a new product, service or idea. + CES Tech South is new to CES 2016 and includes Aria, Vdara and Cosmopolitan Las Vegas. Tech South is location for the marketing, advertising, content and creative communities.